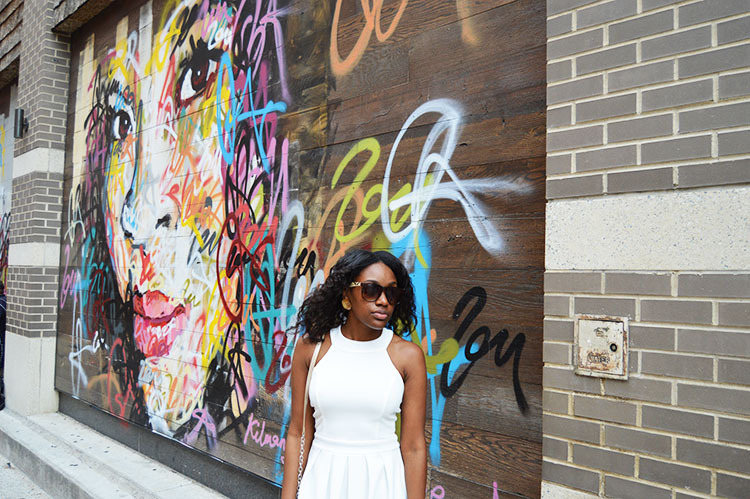 You Down with the LWD? 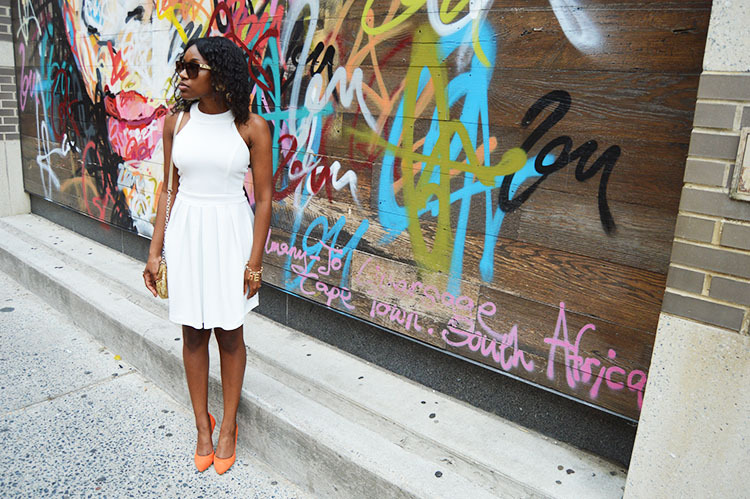 You Down with the LWD? — translation: Do you love the Little White Dress trend as much as I do?! I’m normally scared to wear anything white because I’m that person that always gets something like ketchup splattered all over myself. However, when I tried this dress on in Francesca’s some weeks ago I knew I had to have it. The fit was so adorable! I knew this was a dress that had to be featured on DJS & STYLE, but I needed not only the perfect accessories but the perfect spot to make my LWD pop. About a month ago I saw a photo on my feed reposted by the DMV Network Instagram page. It was a photo of this beautiful mural in Bethesda, Maryland in their Bethesda Row area. The mural by South African artist, Kilmany-Jo Liversage, has had me in awe ever since my first look at it on social media. 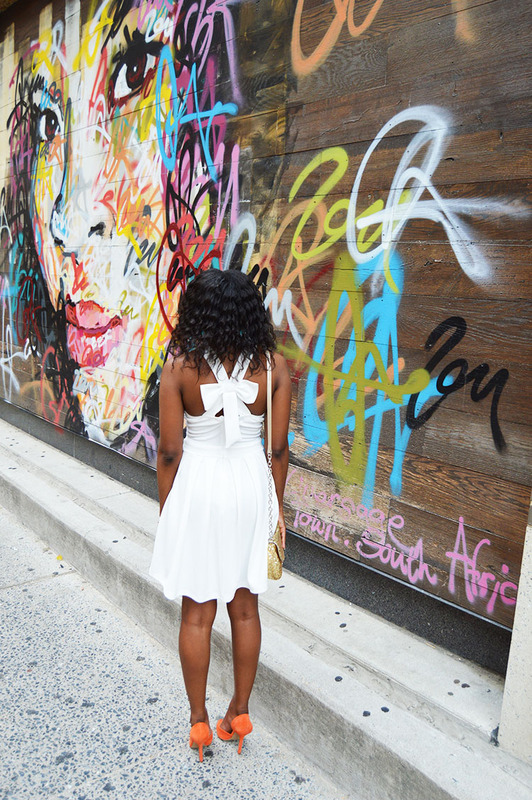 The vibrant colors and the graffiti made it a must for me to make a trip to Bethesda Row to capture this amazing art. I’m happy with the outcome of the photos, but boy oh boy finding the mural was truly an adventure! After showing photos of the mural to strangers (trying to figure out if they knew where this mysterious mural was) and walking around in circles, maybe about 30 minutes later of arriving to Bethesda Row, my fiance and I finally found it! It was all worth it though because the photos came out great! 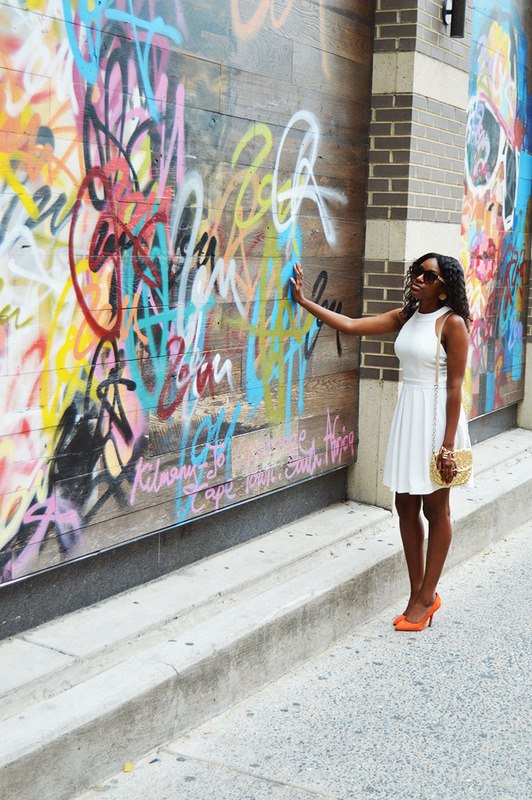 Not only was the mural a great back drop for my all white dress, but my shoes also did a lot of talking for this look. 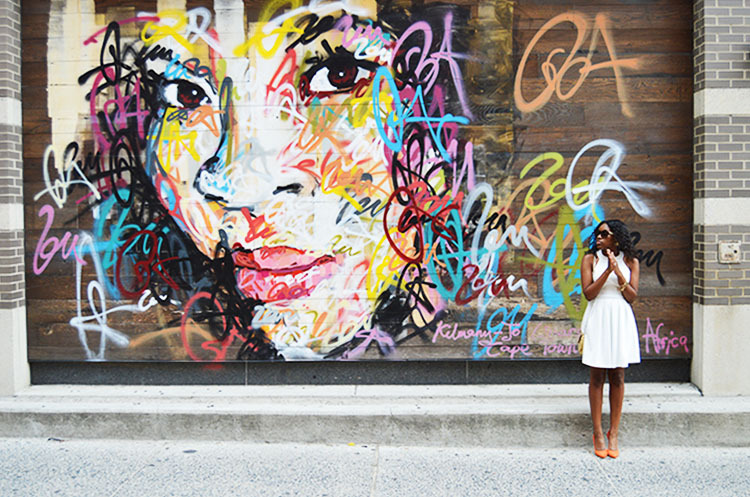 (DJS & STYLE tip of the day: Have fun with the LWD trend by adding color into the look! Trust me you’ll love how it turns out!). All of the accessories even down to the little “Hello” bracelet gave the look a lot of personality and made a little white dress FUN! This dress looks great on you! I’m loving that bow in the back too! Yes after I saw the bow I knew I had to get the dress haha! Thank you! Beautiful pics! The bow on the back is such a lovely detail. Yes I love it. It’s such a cute and girly feel! Thanks!